While I mentioned it in my Globe selections, if you have Amazon Prime and don't use the service to watch some of its original content shows - you should. Between it and Netflix, we are about ready to cut the cable.....sorry Ina. The Prime show which I mentioned - the horribly named the Marvelous Mrs. Masiel - is actually really really good. 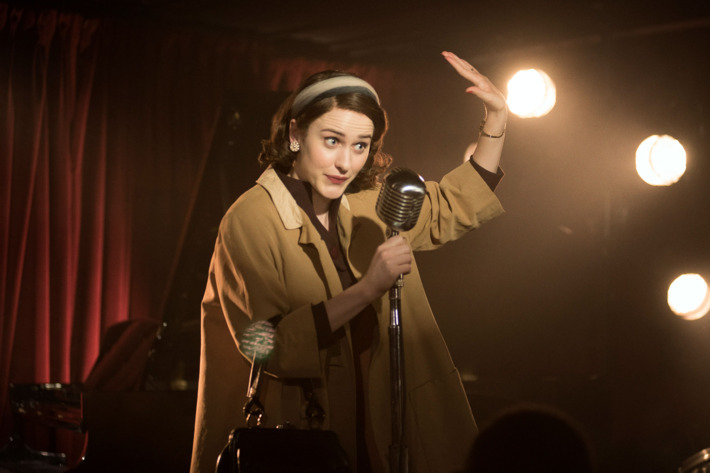 Apparently the Hollywood Foreign Press did too - since Mrs. Maisel won for best actress and the show won best comedy show. The good and the bad of the show is that it is from the Gilmore Girls creators. I loved that show when it was on, but reruns and that horrible Netflix revisit just made me think it didn't age well. ....and it's not that old to begin with. The Maisels and Gilmores share some similarities, but very few. They have strong strong strong female leads. They have a well rounded, quirky cast. They all talk a lot and fast, though not to much overlap like that mother and daughter team. The Maisels swear. More of the ancillary cast than the main character. Brief synopsis: young married couple living in NYC in the late '50s. Upper West Side folks with wannabe downtown yearnings. Husband abruptly leaves wife and now she needs to find a life on her own - which includes stand-up comedy. Oddly, it's not as far-fetched as it sounds. It should be noted that the families are Jewish. It's a big enough of a things to mention, as it plays into any number of areas of the show. It kind of rubs me the wrong way that Miriam comes off as more of a Jew than Lenny Bruce. As if. Rachel Brosnahan is perfect. She really is - I love when someone can embody a role and make it look effortless. . The husband? Meh. When they're together, it's the only time the show rubs me wrong, though I know it's necessary. What/Who I absolutely love are Miriam's parents. O.M.F.G. I don't think Tony Shalhoub has ever been, nor could ever be, better than this. He's out there and extremely nuanced all at once. ....and really, who knew Kevin Pollock would work again, and be good. The production values are amazing. Shot in NYC, yet, the period is spot-on. It seems that no expense was spared, but Bezos is now the richest man in the world - so they can afford it. The first season is only 8 episodes long, but all are extremely well done. I say you give it a shot (though the trailer doesn't give it the due it deserves). Found this on Amazon last Fall and fell in love. That it's from the Gilmore Girls creators makes sense. I too feel that show didn't age well but was great at the time. The husband is major "meh" but he has a cute buddy.